After a hopeful last quarter, the company is once again struggling to add new users. This earnings season has seen the likes of Google, Facebook and Amazon report unsurprisingly profitable results. As the biggest tech players continue to make an embarrassing amount of money in spite of controversy and backlash, we now get to see if smaller upstarts like Snap have had similarly successful quarters. From the looks of the company's just-released earnings report for Q1 2018, things over at Snap have not been very smooth. This quarter, it added just 2 percent new Daily Active Users (DAUs), a drop from the 5 percent increase in Q4 2017. While its overall revenue of $230.7 million is up from the same period last year, that number has dropped 19 percent since the last quarter. Snap attributed this sequential decline to its recent redesign and "seasonality." After struggling for two quarters to add users at a satisfying rate, Snap finally saw its efforts start to pay off in the fourth quarter of last year, hitting an encouraging 5 percent increase in DAU from the quarter before. It focused on improving its Android app and rolled out a redesign aimed at making its interface more user-friendly. Despite some unhappiness over the new look, things appeared to look up for the ephemeral messaging app. Now, we're learning that the redesign may have done more harm than good, at least in the short term. Not only has user growth slowed, but CEO Evan Spiegel also noted in his prepared remarks accompanying the results that there was "a disproportionately negative impact among Android users." He attributed this to "a number of performance regressions" due to "the volume of changes we made with the redesign." The new layout affected users across all operating systems, too. Spiegel said that the March DAU average was lower than the overall first quarter average of 191 million, but pointed out that the number for that month is still higher than the Q4 average. The company had anticipated this negative impact, Spiegel said, noting that "a change this big to existing behavior comes with some disruption, especially given the high frequency of daily engagement of our community." While the company is starting to see early signs of stabilization among its iOS users "as people get used to the changes," Spiegel admits that it still has "a lot of work to do to optimize the new design, especially for our Android users." The slowdown in user growth is troubling for a company like Snap, which is predominantly an ad business. It needs the viewer numbers to convince brands to continue buying spots for their commercials. To that end, Spiegel noted, "Our redesign created some headwinds in our revenue this quarter by disrupting user behavior and creating some apprehension among our advertising partners." Despite the concerns, though, Spiegel said "our advertising business has continued to grow." 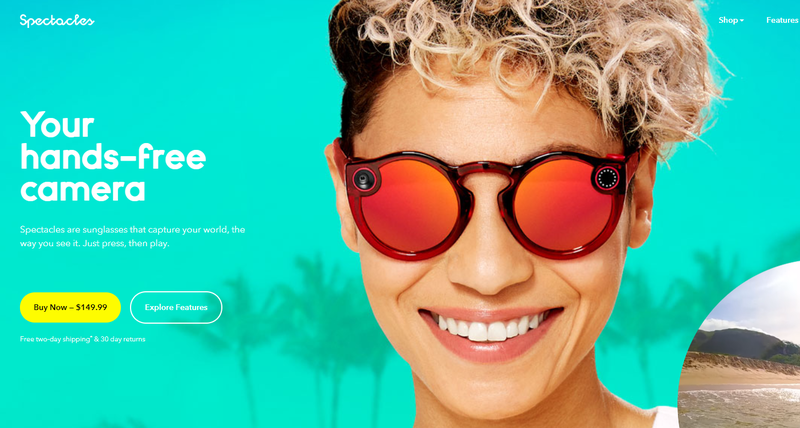 There was no mention of the new Spectacles that the company unveiled last week -- at least, not in the press release and prepared remarks for this afternoon's call, anyway. Curious analysts and media are sure to ask about it during the conference call, and we will update this post with what we learn from that. Update: No one on the call asked about the new Spectacles. Analysts were more concerned with the slow user growth and the company's optimism about recovering from the redesign. Spiegel clarified that the work being put into the Android app involves a complete re-architecture that should dramatically improve efficiency, and is being rolled out in pieces. The upcoming quarter will be crucial for Snap, as it needs to prove that it can bounce back from the disruption caused by its redesign.